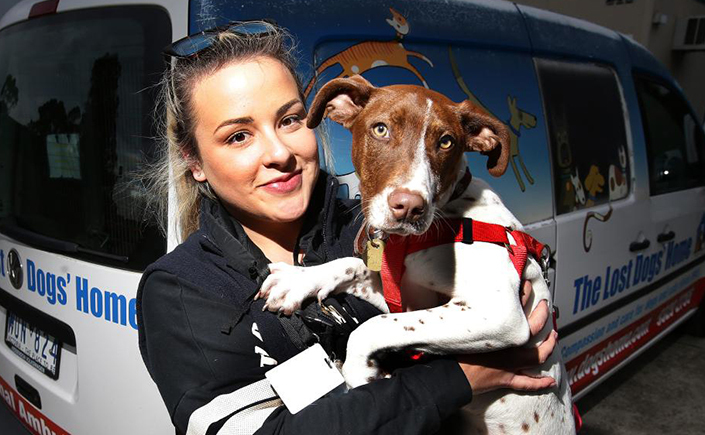 Twenty-four hours a day, seven days a week, the Home’s animal ambulance service rescues lost and abandoned pets across Melbourne. Our ambulance drivers safely transport these pets to the Home’s shelters in Cranbourne or North Melbourne, where they are cared for while our shelter team works to reunite them with their owners. We’re looking for dedicated animal lovers to join our ambulance team as drivers, based in Cranbourne, and in the western and northern suburbs of Melbourne. Over the past year, our fleet of 13 ambulances rescued 523 cats and 3,008 dogs from across Melbourne. “Our ambulance drivers provide the after-hours collection service for nominated councils. The fundamental role is collecting stray animals that members of the community have found,” said Melissa, admissions and ambulance coordinator (formerly an ambulance driver) at the Home. “But, we are not limited to that. I have attended ponies running loose around schools, and dogs stuck in fox holes, just to name a few. Our ambulance drivers are the first step in helping reunite lost pets with their owners, which is one of the Home’s main goals. “The team takes great pride in knowing that although they may be called out at 3am in the morning, they are helping to keep someone’s pet safe, and that is rewarding in itself. The ambulance role definitely lends itself to someone who can work autonomously and under pressure. The position can be trying at times, so it requires a person who is able to be flexible and understanding.